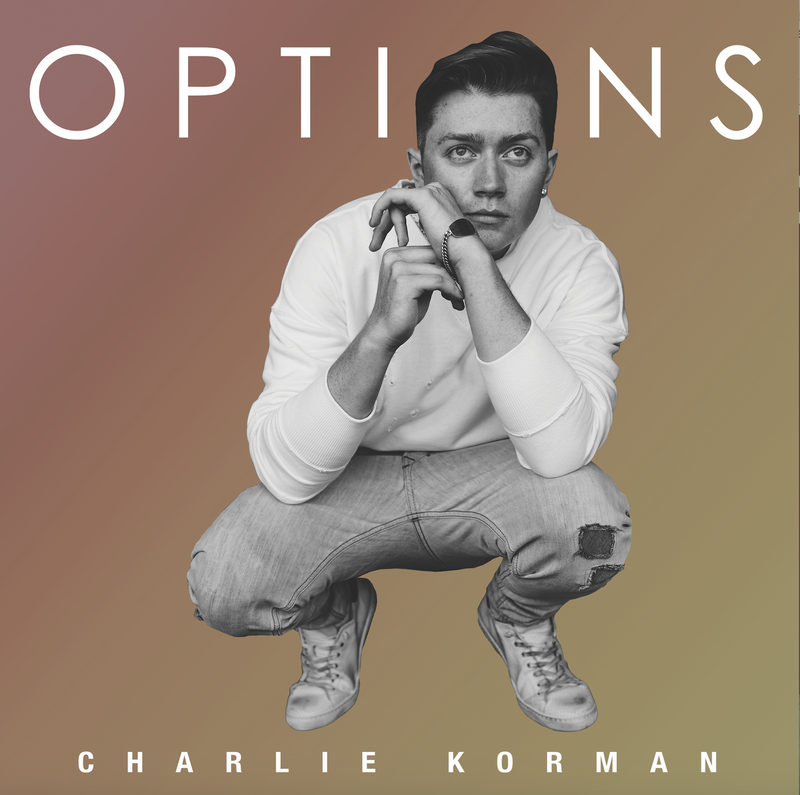 An Interview With The Musician, CHARLIE KORMAN! Meet Charlie Korman! He is a passionate, inspired and talented young musician who relates deeply to what he writes, sings and puts down on paper. Charlie, inspired by such artists as Bruno Mars, Frank Sinatra and Johnny Cash, with a mix of John Mayer and Shawn Mendes, is ready to take the music world by storm with his new single, “OPTIONS,” produced by Grammy-nominated Kosign of Da Internz. “OPTIONS” is a dedication song to his realization that he wasn’t treated well in a relationship he gave everything to, but the word “options” isn’t just a word. It’s more of a meaning that he won’t waste his time and/or energy in the wrong relationship or be taken for granted. The song reflects how he was feeling during those moments. Hailing from Chicago, Illinois, Charlie has lived all over the country and has experienced as much of life as he can in his young age, but he is so excited to keep learning. A student at High Point University in North Carolina, you can always catch him with a notebook around campus. He is always writing, creative at all times. Charlie has always stated he has been singing since the second he learned how to walk. He was aware of his singing ability from the start, but lacked the confidence to pursue music until one of his closest friends heard him singing and motivated him to do something with his voice. Charlie would love to inspire others to understand that we all are human beings who go through breakups, heartaches, depression, happiness, growing, etc. His music comes from everything he dealt with throughout his young life. He has never written anything that is a lie and/or untrue. He hopes to continue being raw, real, and honest with his fans and his music. Besides working on his craft, he loves being around the ones he loves, works out, travels when he can, and most importantly, tries to live a great life where he makes others happy as well as himself. He has a huge passion for animals, and whenever he has the chance to help or fund an animal welfare organization, he jumps at the opportunity. He recently went to Africa and supported the elephant walk in Kenya. Thank you for asking! My day is going great! I’m grateful, thank you for taking the time out to do this interview. Overall, I think it was very successful, but I’m still building and learning every single day, if it’s a better artist, person, writer, etc. It gave me time to learn about who I am, especially as an artist’ and prepare me for 2018. I’m honestly more excited right now to see where things go. I can’t wait to put more things out there for the fans, especially to go on tour! That is my 2018, is to go on tour! I actually did, YES! 100 percent! I don’t even remember saying it, “I want to be a musician…” but I do remember an old picture that my mom has of me, was probably around first grade where I’m holding a mic or playing an instrument. I think my mom knew then that an artist was in the family. My mom even asked me, “What do you want to do when you are older?” And I said, “I want to be a rock star.” So there you have it! My first musical experience. When I was barely old enough to watch or listen to artists or musicals, it struck me. I remember watching Tarzan and started to just hum or learn the lyrics to the songs and sing them. I think the song was done by Phil Collins in Tarzan, and I wanted to learn it so bad! How do you think growing up in your hometown has influenced your sound and who you are as a musician? What about going to school in North Carolina? It’s hard to say one place I grew up influenced me, growing up I moved around a lot, I had a little taste of everything. Influences from a city, a suburb, the outdoors to even the beaches of Florida. I was influenced by so many of my surroundings, the culture, the energy, the way of living, the people, etc. I met so many different influences and all of that shaped me into the artist and person I am. Going to school is an amazing experience, education is definitely something I have, it’s a lot of hard work, time and energy, but so is everything in life. I like to have balance in my life, especially with singing, writing and/or creating and going to school. You always have time to learn! Let’s talk about your newest single “OPTIONS.” What was the inspiration for this track? What was it like working with the Grammy-nominated producer Kosign of Da Internz on it? I was out in L.A. and I was in a “situation,” for a while actually, it’s pretty self-explanatory in the lyrics. I’m sure a lot of people can relate to some parts of the song and/or the entire song. It’s not about having “Options.” It’s about the message, meaning, why am I in this “situation” that causes pain, irritation, anger, sadness, happiness, etc. When I can, well “Options” in my life, I don’t have to be in this situation anymore that causes the emotions I have, if that makes sense. It’s been amazing in collaborating with Kosign, they have been with me since my first song, they are like family to me. They are extremely creative, talent and created some great material, they believed in me, that’s all I could ask for. I would love to know more about your recent Africa trip to support the elephant walk in Kenya? My mom is actually in Africa now, she is doing a term for the Peace Corps, she inspires me every day! I went over to Africa with her before she committed to the long-term stay, she is over there for two years. I admire her. My trip was inspiring, educational, uplifting and every other word I can’t fill this question up with. For me, I took in everything and everyone, especially how endangered the animals are over there right now, it’s very sad. Me and my family try to support the animals as well as the community. These people have nothing but love and happiness in their souls, it’s a life-changing experience. The animals are beautiful, caring, and it’s an experience that will change your life. I want my kids to see how these animals are a beautiful part of our world, including the community of people there. My mom actually had a group of girls listen to my song, “Options,” and they loved it! It was an honor, the girls ended up singing my song and recorded it, sent it to me. That makes me so incredibly happy in what I do. Where do you find that you sing the most- in the shower, in the car or elsewhere? Hmmm … another great question. I find it more enjoyable to actually perform in front of people, but I love the entire process of it all! It’s all fun! Where can fans see you perform next? What do you think makes for an ideal concert for you? I try to be really active on all platforms of my social media, but I do go to school full-time while I do music, so you probably know it can be difficult to be very active on social media, but I try my best! I know it’s very important, I actually love the access, you can get glimpses of my work, my creative and/or my everyday life. I think being personable is very important, and social media has given people a voice, and as a musician it has given us a platform. Regardless of the day, if it’s a great day or a horrible day, I try to find the most joy of life, because you only have so much of it. Music lets me express that, it’s a form of therapy for me, people have so many different way to express themselves and music is it. Some of my favorite artists and those who inspire me are all across the board, if it’s Phil Collins, Bruno Mars, Frank Sinatra, Whitney Houston, Sza and/or Johnny Cash, I’m all over the place. I just love music and I’m inspired by so many different genres, artists and music. I would love to work with any I just mentioned, but I’m open! I want them to take away the realness of my music, the feeling and who I am as a person/artist. Music, writing music, is how I express myself the best, it’s hard for me to share any sort of feeling and/or emotion personally, so I take the lane of music and writing. Like I said previously, it’s my form of therapy, how I’m feeling at that moment, the experience I am or was going through, etc. I hope my fans take that away. Thank you so much for your time! I’m very blessed and grateful to be where I am and I thank the fans, my friends, and family, and the people who give me this platform to express myself. Thank you for sticking with me in this crazy journey I’m in, it’s just starting. An Interview With The Artist, GNA, On Her Single ‘Love Me’ And More! An Interview With The Singer-Songwriter And Mental Health Advocate, X.ARI!